They may have kicked of their 2018/19 campaign with a big win, but it wouldn’t be the Knicks if they didn’t have a shaky start. In a quintessential start to the season, the Knicks went 0-9 on their first nine attempts. 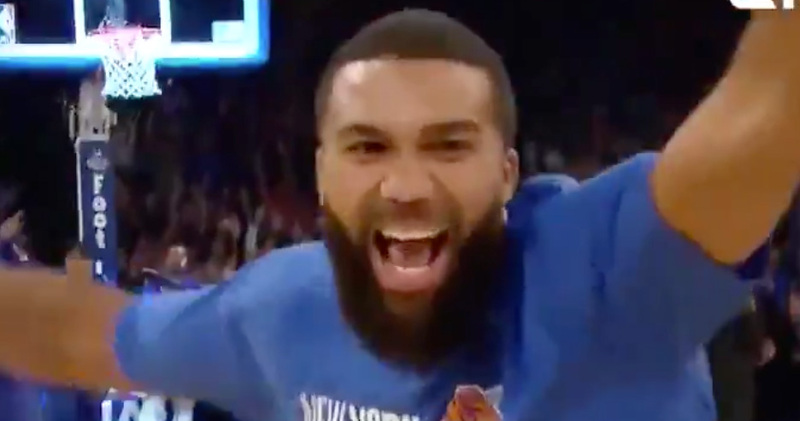 To make their start even more embarrassing, in an early timeout, a fan hit a half court shot at Madison Square Garden to win a whopping $10,000 prize — and this was all before any Knick had even hit a field goal. Prior to the $10,000 moment, the Knicks were 0-9 from the floor and were without a made shot during the first four minutes of the contest. But it looks like this fan’s half court heave was enough to excite the Knicks out of their hole, as Tim Hardaway Jr. was able put his team on the board straight away with a three pointer. They went on to smash the Hawks by 19 points. Perhaps they should get this guy as a mascot whenever the Knicks are in a funk — and maybe, just maybe, the Knicks will get back into the post season. Hell, maybe even give the guy a 10-day. It wouldn’t hurt their chances at all.